24 scientists. All of them men. If you know any of them, as I do, I would recommend you contact them and suggest they resign from this apparently gender-biased organization or force them to add some women to their advisory panel. 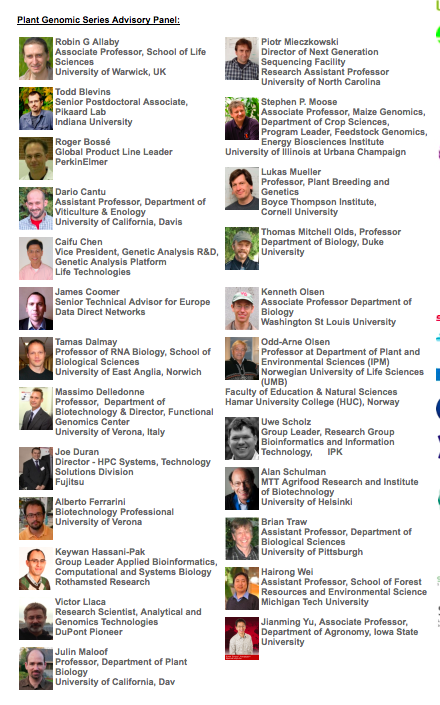 The speaker list for their next plant genomics meeting is quite skewed too. I could find 49 men and 5 women. What a joke. I call upon everyone in the community to boycott this meeting and any organized by Global Engage in the future. They have been informed previously of their gender ratio issues and are clearly not doing anything about it. And in plant genomics there are so many excellent female scientists that this simply has to be a case of some type of bias. In addition, I would recommend calling on the sponsors to withhold funding from this meeting and others organized by this group. 0/24 on the advisory panel does indeed seem quite biased. However, some blame for gender-biased meetings must have to fall on the continuing biased composition of university departments, especially in the senior ranks. For example, from my count that plant genomics meeting speaker list now stands at 8/56 female (14%). That's not too far off the make-up of the UC Davis Genome Center faculty (18%?). I think without a doubt the pool of available speakers is important. But in this case the pool of available plant genomics speakers is filled with potential female speakers. So without a doubt this does not explain the bias in this meeting. As for the UC Davis genome center - I cimpletely agree with you. The genome center faculty is severely skewed towards men. I note - it was a comment on a blog post like this one that first made me extre aware of this issue at UC Davis and since then I have worked very hard on the issue of women faculty at UC Davis and also for any group in which I am involved. See the blog post here . This led me to join the UC Davis ADVANCE program trying to improve hiring and retention of women and URM faculty in STEM fields at UCD. And it also led me to work to change the PLOS Biology Advisory Board (some thread in the blog post). I have also tried to effect change in the UCD Genome Center faculty and will continue to do so. It has been slow in part because the Genome Center is not a department and is not solely responsible for hiring. In contrast, in my home department of Evolution and Ecology, many of the faculty there have been working hard to improve the gender ratio in the department and it is easier to influence when the department is in charge of hiring. There, three of the last four hires have been women. Thanks for pointing me towards the older post - the probability analysis is great. And I don't mean to pick on the UCD genome center in particular - there are plenty of departments and centers with similar gender ratios. Unfortunately, it's likely to stay that way for a while, even with parity in hiring from here on out.